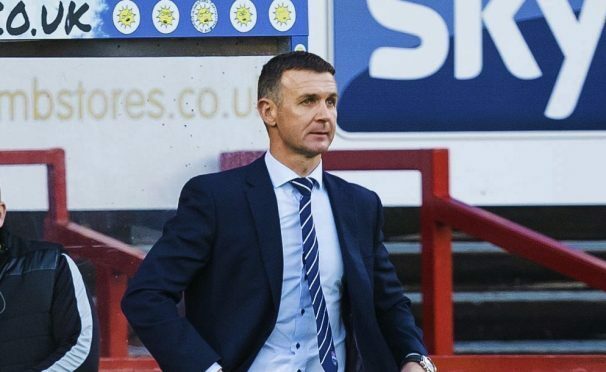 Jim McIntyre is delighted with Ross County’s progress, despite their Spanish tour closing with a 2-1 defeat by French club Valenciennes last night. The County manager was unconcerned by the scoreline as he saw the reshaped Staggies step up a level in sharpness and performance. The Dingwall team moved along the coast to the plush Pinatar Arena, near Murcia airport, for the friendly against fellow tourists and were treated to a rare Spanish summer phenomenon – rain. Despite Alex Schalk’s headed 35th-minute opener for the Staggies, the French side edged it with goals from Mothiba (38min) and Ndao (65min). McIntyre said: “It was a great workout for us, playing against a good side. “Going into the game we’d done a hard training session in the morning and we expected to push the boys right to the limits, which we did. “Most of the team got more than 45 minutes tonight which was the object, playing against a very sharp team with a lot of pace. “We played well, I was really pleased. We should have scored a couple more goals with one disallowed, another off the post. “The players knew they would be in a real game tonight and had to be up a level in terms of touch and movement. “Valenciennes have a lot of good French-African players. “It has been a great trip. We’ve worked very hard but made sure we’ve got the balance right. Touch wood, we haven’t picked up any injuries. McIntyre started new arrivals Thomas Mikkelsen, signed from Odense, on-loan Celtic midfielder Jamie Lindsay and ex-St Mirren and Wimbledon left back Sean Kelly. County’s breakthrough arrived after 35 minutes with Schalk finishing brilliantly with an angled header from a Davies flick-on from Gardyne’s free kick. Just three minutes later, though, the Dingwall defence failed to deal with a measured Sebastian Roudet ball over the top as it caught the strong breeze. Mothiba showed pace to fend off Davies and van der Weg and easily beat keeper Fox from 10 yards. Gardyne went agonisingly close to restoring the lead before the break, crashing into the netting as he stretched to meet a Ryan Dow delivery close-in only to see the ball spin wide. Davies then thought he had headed County’s second on half-time but the offside flag was raised. From Tim Mauricio’s ball into the box, Senegalese striker Lamine Ndao smashed an angled 12-yard strike past Fox to send Valenciennes ahead after 65 minutes of play. County goalkeeper Fox pulled off a tremendous diving save from Mauricio’s 25-yard strike with five minutes remaining. County came so close to levelling when youngster Ross MacIver cracked the post with force late-on after dogged work by Routis on the left.